Achill-based landscape artist Padraig McCaul turned 50 this year. So far his lifetime, he’s worn many different hats. Arts student. Accountancy student. Clothing retailer. IT professional. Band member of The Harvest Ministers. Husband and dad. Artist. Some hats he tried on, didn’t like the fit and put away; others he continues to wear with pride. The old stressful life in retail and IT now is a distant memory. Now, he’s a full-time artist, producing his own work and giving classes. For many years, McCaul’s landscapes were unpopulated – buildings might appear, but never people. That’s changed now too. Originally from Dún Laoghaire in Dublin, McCaul now lives on Achill with his wife, Anne, and their three children, six-year-old twins Claire and Rory and three-year-old Tom. His family have become part of his work, and along with the island, they too now are inspiration and motivation. ‘Island Life’, an exhibition of McCaul’s work, opened in The Western Light Art Gallery, Keel, Achill, on Sunday. In it, viewers will find McCaul’s distinctive landscapes, some peopled, some not. All are Achill. 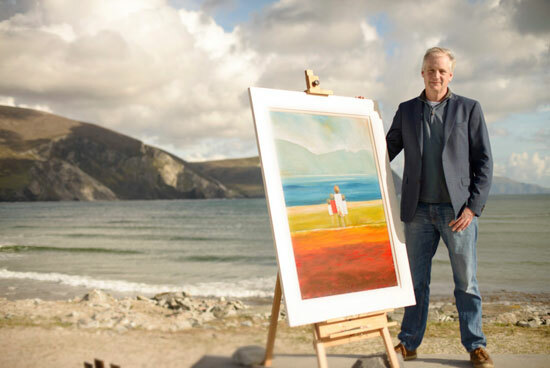 “Friends of mine used to come to Achill camping every year, and when I started painting – about 15 years ago – they said, ‘you’ve got to come over to here’,” McCaul tells The Mayo News. “I’d never been before. I came over for the first time maybe 12 years ago. I came over on my own. I’d spent two months in San Francisco with work and it was quite a stressful job over there … When I came home I said, I’m going to take a week off – I need a break from this. So I used that time to come over to Achill. “I booked myself into the Bervie Guesthouse, and I just had the most incredible four days. I’d never been struck by a place … I was just gobsmacked. It was June – glorious sunshine, blue skies. I was just blown away. Completely and utterly captivated. Every day I was looking at different parts, and I just fell in love with the place. The west constantly tugged, and eventually, the McCauls decided to stay. “When the twins were ready to go to school … we said we’d come down to Achill and see how it works out. And it’s been brilliant; absolutely great. Since moving to Achill, the island has formed the bulk of what McCaul paints. Words such as ‘desolate’, ‘stark’, ‘quiet’, ‘provocative’ have been used to describe McCaul’s work. While the qualities are certainly there, the paintings are not depressing. McCaul found ways to use the same colours, but ‘to make them believable’ in an Irish landscape. “With a lot of traditional Irish landscape [art], the colours might be true to what you see on a fairly dull day, but they just don’t convey any sense of warmth. “I use the colours to get the right feeling. That feeling, say, of standing on the beach all on your own. That’s one of my first memories of Achill. I couldn’t sleep, so I got up at about six in the morning and went for a walk on the beach. A beautiful summer’s morning – no one there, tide out. It was just this idyllic morning. The sound of the sea, the breeze, the cliffs. And I was sketching it – but how do you get across that amazing sense of feeling, that sense of being there on your own, listening to the water, the early-morning birds and the wind? I think colours are a way of doing that. McCaul’s work has recently begun to move away from ‘strict landscape’, and he has started to introduce figures. Merriman wouldn’t take no for an answer, however, so McCaul gave it a go – and he discovered a new element to incorporate into his landscape art. “I was looking for a way to put people or figures into the paintings that allowed me to use them in the same way that I use the buildings – as focal points, where I could put lots of colour and lots of texture but very little detail. So I started putting in very simple spherical heads and a body and two legs and that’s it. Everything else – all the character – is in the colour, and maybe the slight of a figure’s stance. You can put a lot of expression and character into that. And the figures themselves? Well, they were there all along, under another of McCaul’s favourite hats. They are the members of his own family. The focal points might be kept simple, but there’s one detail likely to resonate with local viewers: the occasional appearance of a Mayo jersey. “Ah,” McCaul laughs, “That’s ’cause unfortunately my kids, the three of them, have switched over to Mayo. So we’ve got three Mayo supporters in the house. My little guy, Rory, started playing football about two years ago, and he’s really gone completely Mayo mad. We go into McHale Park for the home games. I tried to push Dublin at them, but they’re not interested…! Padraig McCaul’s exhibition, ‘Island Life’, is running at The Western Light Art Gallery, Keel, Achill, throughout the summer. For more information on the artist, his work and his classes, visit www.padraigmccaul.com.